After a strong storm blows through or a landscaping project gets wrapped up, your yard can be left with quite a scattering of leaves, tree branches, grass clippings, dirt, and more. Fortunately, yard waste disposal is another service you can easily check off your list thanks to the versatile team at JDog Junk Removal Capital Region. We’re as beneficial to your property outside as we are inside, offering yard waste removal that’s prompt and pleasantly inexpensive. You have enough to deal with just keeping up with the routine mowing and other yard work. Why not let our debris removal pros tackle the rest? Reach us in the Schenectady area today to arrange for storm debris removal or yard waste pickup!  With JDog Junk Removal Capital Region on standby, you’ll never have to live with litter all over your lawn again. Better yet, you won’t have to break your back ever again raking up yard debris and stuffing it all into bags. Our yard waste disposal staff is here to take the labor and long hours out of your seasonal lawn and storm debris removal. Our team is available in Schenectady and all across the Capital District so you can relax and find better things to do in the nice weather than deal with yard waste pickup. We can even combine your lawn debris removal with exterior demolition service, so you can say goodbye to everything from broken branches and garden waste to dilapidated decks and sheds. Imagine a clean, spotless lawn and you don’t have to life a finger. That’s the beauty of making JDog Junk Removal Capital Region your go-to resource in the Schenectady area for full-service yard waste disposal. We have the equipment and manpower to complete your yard waste removal work in short order. Of course, that’s what you would expect from a fully insured debris removal company owned and operated by veterans. Let us continue to serve you and your local property needs with our yard waste pickup offerings. We’ll start you off with a free estimate so you can compare our fair rates on yard debris disposal with other nearby businesses. In the end, you’re sure to appreciate our punctual, professional, and affordable approach to keeping your yard looking its very best. Contact us today for routine or emergency yard waste pickup. We’ll be over soon to shape up your yard!